Visiting Howard University is always a pleasure. 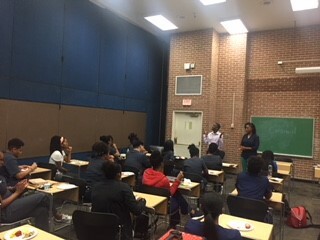 We were invited by Tayler Jackson, President of the Holistic Dental Student Association at Howard; to speak about our Holistic, Biological and Eco-Friendly practice. 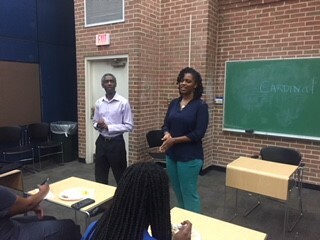 Dr. Terry Victor and Dr. Jada Daniel spoke to the Dental students about the impact The DC Dentist practice has had on the surrounding community as well as our global community. 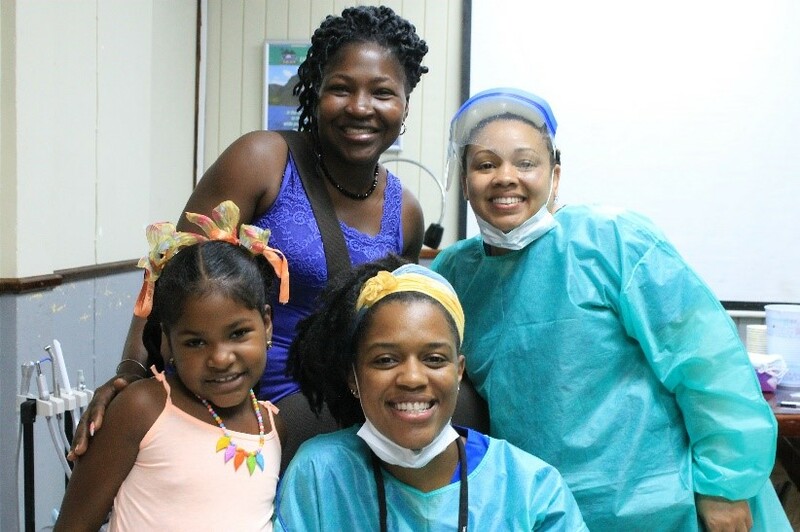 The DC Dentist team recently returned from serving the people of Soufriere, St. Lucia in its first Mission Trip abroad this past April-May. The trip allowed the dentists and hygienist to see over 200 people including children as young as 3 years old providing education on oral health, cleanings, fillings, extractions as well as toothbrushes, toothpaste, rinse, and floss. The impact The DC Dentist has had on DC include being voted Best of DC for the 3rd year in a row and the 4th overall as well as having been nominated this year for the People’s Choice Award by Sustainability DC. Being the first Holistic, Biological and Eco-Friendly Dental office in the metropolitan area has allowed The DC Dentist to be a shining light to other businesses on building and maintaining a sustainable office as well as offering a Holistic/Biological approach to Dentistry that patient’s truly appreciate and love. 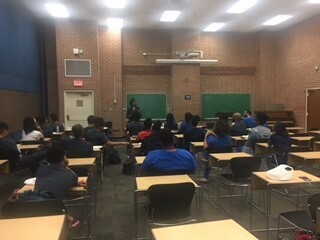 We are thankful for the opportunity to speak with the Holistic Dental Student Association at Howard and look forward to meeting again. In fact The DC Dentist will be at Howard next month to speak with the students of the SHPEP program which we enjoyed from last year. We give thanks for the opportunities to share our words of wisdom. 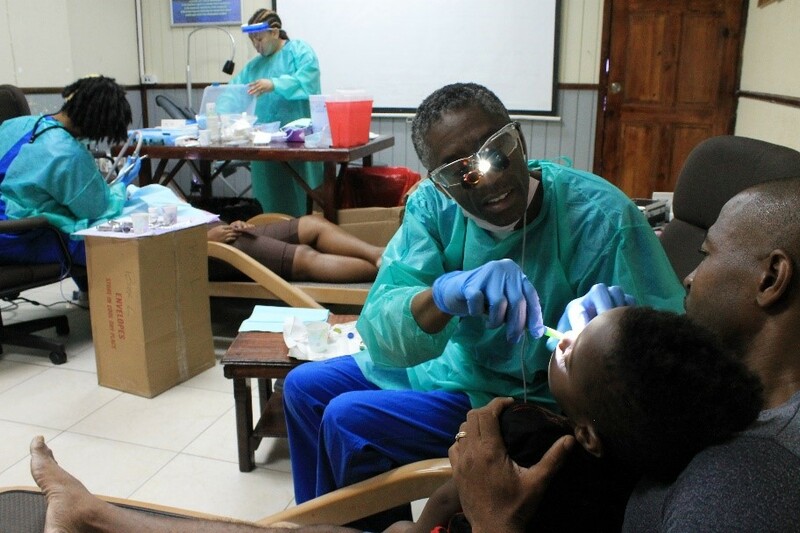 The DC Dentist is back from a very successful Mission Trip to St. Lucia where the office provided free Dentistry to over 200 people in Soufriere, St. Lucia. Thanks to Dr. Terry Victor and The DC Dentist staff including Dr. Jada Daniel and Hygienist Cheryl Lewis and their efforts in providing the best dental care possible in a boardroom that magically turned into a make shift dental clinic. 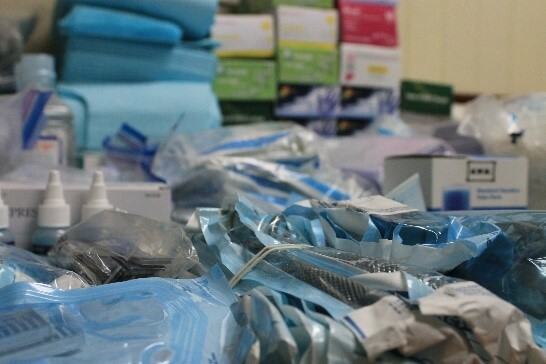 These efforts were made possible in part by Saint Lucia Medical and Dental Association (SLMDA) who supported our efforts to give back to the Soufriere community. 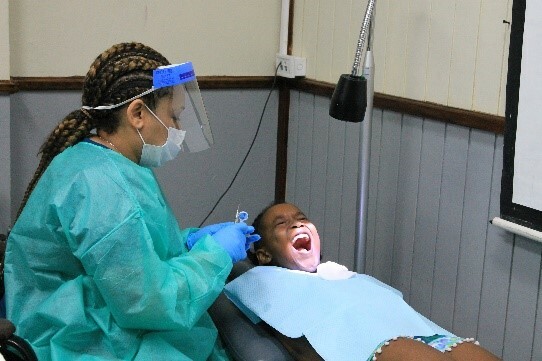 The Dental Clinic took place inside the Soufriere Regional Development Foundation (SRDF) and the whole event was spearheaded by TOCO Foundation (They Often Cry Outreach). 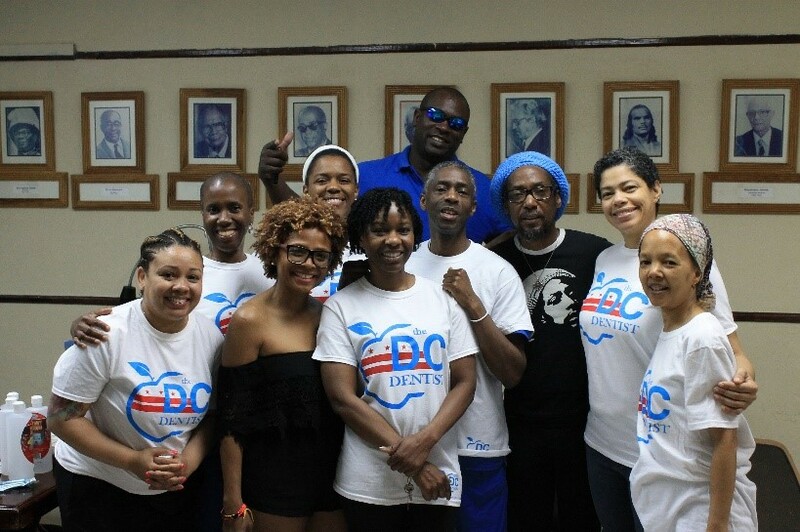 This was a wonderful opportunity for The DC Dentist team to issue dental hygiene advice, cleanings, fillings and extractions to the beautiful people of St. Lucia. Restoring smiles, treating each patient with care, accommodating the needs of patients of all ages, implementing healing, delivering hugs and receiving the benefits of many thanks were a few of the effects from our travel to St. Lucia. In addition to receiving a warm welcome, The DC Dentist team enjoyed seeing a few sights in Soufriere which included the Piton, Sulphur Springs, Rain Forest, Tet Paul Nature Trail, Waterfalls and we were surrounded by beautiful beaches and friendly people. Plus the food was fresh and absolutely delicious. 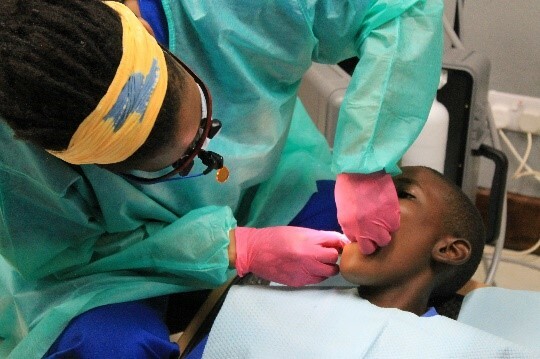 “We want the people of St. Lucia to understand the direct correlation between good oral care and overall health and well-being so we brought with us supplies of floss, rinse, toothbrushes, toothpaste and discussed how good oral health care can rid or better yet, prevent many diseases that can compromise overall health and the importance of maintaining a clean mouth,” said Dr. Victor of The DC Dentist who in addition to Dr. Daniel have roots in St. Lucia. Soufriere students arrived from 4 different schools to be seen as the Dental Clinic took place April 28-30, 2018. For three full days we were able to care for over 200 community members receiving free dental services through outreach initiative thanks to the TOCO Foundation. Clinics delivered by Washington DC based Holistic, Biological and Eco-Friendly Dental practitioner Dr. Terry Victor, and his team discussed with patients the proper oral care techniques plus importance and benefits of regular dental exams. Dr. Victor voted “Best Dentist” in Washington City Paper’s Best of DC for the 3rd year in row and 4th overall. Clinics made possible with support from SLMDA, Helen Television Systems, Diamond Villas and the Saint Lucia Government in collaboration with the SRDF. Clinics which took place on SRDA premises attracted adults and children as young as 3 years old. TOCO Chairman Taj Weekes disclosed a primary group targeted by dental clinics as the Rastafarian community. "I had noticed that Rasta brothers living outside of the mainstream of society seem unable to access professional dental services, often because they cannot afford it. Everyone should have a decent smile and good oral care which promotes good overall health. So for TOCO, good response from the Rastafarian community was an important outcome of the clinics", Mr. Weekes explained. Care packets containing toothbrush, toothpaste, floss and dental hygiene literature distributed to everyone who availed themselves of the free service while additional supplies were distributed to schools on the outskirts of Soufriere that could not have been accommodated due to the volume and time constraints. Supplies and equipment were shipped to St. Lucia weeks in advance thanks to the many companies who contributed to the Mission Trip. Companies such as Sirona, Henry Schein, Ultradent, Lotus Brand, Sunstar, Oral-B, Bisco, Newark Pemco Dental, Benco, and others that continue to support our efforts of helping people in need. As key partners, the Soufriere Regional Department Foundation, St. Lucia Medical and Dental Association receives high praise from TOCO for the community mobilization and for guidance to TOCO and the The DC Dentist staff in meeting state compliance requirements. "The viability of a project is in the countless details and due diligence. The guidance of Dr Sherry Ephraim of SLMDA and the sweat of Mr. Herod Stanislas was critical to the success of the clinics. TOCO always wants to do more, but ultimately what we can accomplish is often dependent on who is with us and the responsiveness of local counterparts", said Mrs. Angela Weekes of TOCO. The Mission Trip was made possible through the efforts of the TOCO Foundation led by Taj Weekes. They Often Cry Outreach (TOCO) is a U.S. based, not-for profit organization with a mission to raise awareness and address the issues that affect Caribbean youth through comprehensive projects and initiatives on every island in the Caribbean. TOCO's projects range from after school sports programs, a diabetes awareness initiative, a domestic violence awareness campaign, artistic programs and now Dental Mission Trip. Taj Weekes' humanitarian work has been a staple of his celebrity, using every opportunity to serve and speak on behalf of the children of the Caribbean. He personally travels and distributes donated items to the islands, lectures to high school and college students on topics ranging from volunteerism to acceptance and tolerance, and donates his own money to ensure that TOCO can fulfill its missions. In 2012, he received a humanitarian award from the St. Lucian government for his work through TOCO. The DC Dentist team made it possible to heal a great number of people from Soufriere due in part to the vision of Dr. Terry Victor. 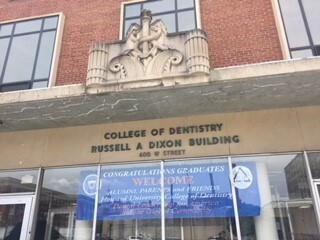 Dr. Victor is a member of the Academy of General Dentistry. He is an accredited member of the International Academy of Oral Medicine and Toxicology (IAOMT) and a graduate of the prestigious Foundation for Advanced Continuing Education (FACE). The DC Dentist is a member of the Eco-Dentistry Association and Green America. I am very happy to recommend the DC Dentist. I started going there individually some time ago. I look back one day and it was a neighborhood practice, holistic and environmentally friendly. Upon my first visit, I also came to really enjoy the staff. They are all very friendly, very helpful, clearly knowledgeable and great professionals overall. Dr. Victor is great. It was always great to see him and have him work with us. I subsequently, got the rest of my family going, my wife and two kids and they are happy. Speaking of the kids, we are always happy to go to the dentist. It’s kind of an amazing thing. I think it’s because of the friendliness and the greatness of the staff. I am very happy to recommend The DC Dentist to anyone out there. They are Fantastic! This is a great opportunity to meet others within the community, enjoy Yoga and learn about the many small businesses throughout the city including Eastern Market. We will be giving away 100 Shop Small bags filled with items from area businesses so you will have the opportunity to sample as well as visit the various businesses. Thinking about gifts for your loved ones - you may shop at The DC Dentist. Here's your opportunity to try an electric toothbrush, our special toothpaste and mouth rinse without all the added chemicals. Learn how Holistic-Biological Dentistry improves your life. Discover the different ways you can save the earth in your own home by seeing what our office provides on a daily basis that is eco-friendly. Come experience the difference as The DC Dentist is not your ordinary dental office. 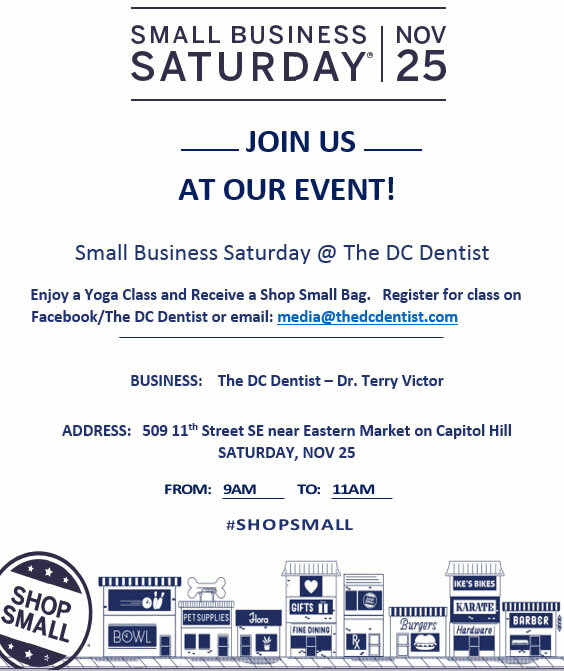 If you think you may skip the Yoga class but still want one of those specialty shopping bags then email our office at media@thedcdentist.com to reserve your bag. Do it today and you will be off to a great holiday. The DC Dentist Candy Buy Back Program November 1, 2017 to November 8, 2017. Call 202-544-3626 for further details. Thank you to The Raw Girl for visiting our office and sharing our philosophy on Holistic, Biological and Eco-Friendly Dentistry. After watching, if you have questions give us a call at 202-544-3626. We're here to help you achieve Healthy Teeth & Gums for Life! One of the biggest fears people have concerning a visit to the dentist is the fear of pain. This can include the pain of getting an injection or pain after the dental procedure is completed. Traditionally this has kept many people from visiting their dentist. Today in dentistry there have been many advancements in the type of anesthesia available, which can provide a patient the comfort of not feeling anything during a procedure. Actually, there should be no pain or discomfort throughout any dental procedure. If something is felt, either there was not enough anesthesia given or it was not well placed. There are many solutions to decreasing pain in dentistry. If a patient is anxious about pain with the injection, a gel anesthesia can be placed on the gums so nothing is felt. If the concern is with pain after the dental procedure, there are many options available from pharmaceutical to homeopathic remedies. In holistic and biological dentistry, the philosophy is not to depend on pharmaceuticals but to use more natural remedies. For example, food or herbs with anti-inflammatory properties help to put the body in a position to decrease pain sensation. Another good alternative is homeopathic remedies, which are non-toxic, chemically free medications. They have been used throughout the world, not just to relieve pain but also to help relieve many other ailments. Because there are many options available to avoid and decrease pain in dentistry, no one should be fearful of dental treatment. By using one of these methods, every patient can have a better, pain-free dental experience. Overcoming a Child’s Fear of the Dentist. One of the most frequent issues patients have with dentistry is fear of the dentist. It could be fear of the dental situation, including fear of the dental “drill”, “needle” or of the unknown. Another big fear is of being in pain. Each of these fears show a level of discomfort and anxiety. These fears usually originate in childhood from a traumatic dental experience. Children often feel powerless in this adult world. This can be exaggerated especially if the child is forced to have a dental procedure, which may lead to life-long fears of that twice-a-year visit. 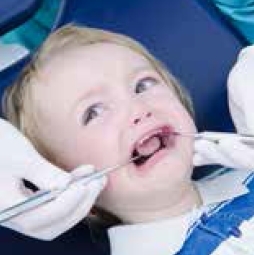 Here are some suggestions on how not to traumatize a child going to the dentist. First, when the child’s very young (one-year-old or younger) have the child come to the dentist with a parent or older sibling. This will show the child the new environment is non-threatening. At that time. their holistic/biological dentist will ask them to open their mouth to take a look. If they do not want to, they are not forced. At the next six-month cleaning appointment, they can come back and try again. It is amazing to see that same child, by the time they are about 2 years old, come to the dentist and open their mouth for exam and cleaning without any issues. The next suggestion for a good dental experience is to limit the dental work. It is best if children come to the dentist to have their teeth cleaned. To accomplish this, bring them in early, help them develop good oral hygiene habits with brushing at home and tell them the importance of taking care of their teeth. Another important part of this is to have sealants placed on their teeth when they get their adult back teeth. These suggestions make a huge difference in the way a child perceives going to the dentist. This will decrease the number of people who experience anxiety when they go to the dentist. Dr. Terry Victor, The DC Dentist, provides holistic, biological and eco-friendly general restorative and cosmetic dentistry. His practice is located at 509 11th Street SE, on Capitol Hill. For more information, call 202-544-3626 or visit TheDCDentist.com. February is Heart Health Month. Did you know your oral health care is directly related to your overall health? When visiting our Holistic Dentist, each patient’s overall health is taken into consideration when discussing each patient’s oral care treatment. The warning signs for a stroke include: Face Drooping, Arm Weakness, Speech Difficulty, then it’s Time to call 911. You don’t want to wait to see the doctor in the emergency room just as you don’t want to wait until your teeth are falling out to see your dentist. The signals you need to see a dentist include: bleeding gums, hot/cold sensitivity, trouble eating or any kind of pain in your mouth. Often people ignore these signs thinking their mouth will heal on its own but instead it becomes a bigger problem. The DC Dentist believe in preventive medicine. What has been discovered is that taking good care of your oral health helps with your heart health as well. Once plaque is left on your teeth it turns into tartar which must be removed by a professional. In order to keep this plaque from increasing you must see the dentist every 6 months. In fact, the same bacteria that is found on your teeth can travel directly to your heart. Your heart tissue and gum tissue are similar. Preventive medicine is the best medicine. If you are experiencing any kind of pain, call our office, 202-544-3626. It is better to have our dentist do a comprehensive exam then for you to wonder if everything is ok. Bleeding gums is a signal you need to see our holistic dentist to discover the root of the issue. The DC Dentist believes in providing you with the proper tools to care for your overall health. Our Hygienist works with you to develop good oral hygiene habits which includes an oral cancer screening at each appointment which is part of your Preventative Care Treatment. A visit to our Hygienist helps to maintain accurate records of your oral care and helps to answer any questions you may have regarding your flossing, brushing and rinsing techniques. How often should you floss, brush and rinse your teeth? Quick – the answer is after every meal. If that’s not possible, then as close to that as you can. This will help to prevent tartar from building up around your teeth and gums. Our Holistic, Biological and Eco-Friendly Dentist ensures that your health care is on track, not just your oral care but your overall health care. We want everyone to have Healthy Teeth & Gums for Life! Heart Health Month or any month is the perfect time to schedule your 6 month visits to our Dentist. That’s two visits each year. Make the call today to 202-544-3626 and we’ll be happy to see you now and again in 6 months. 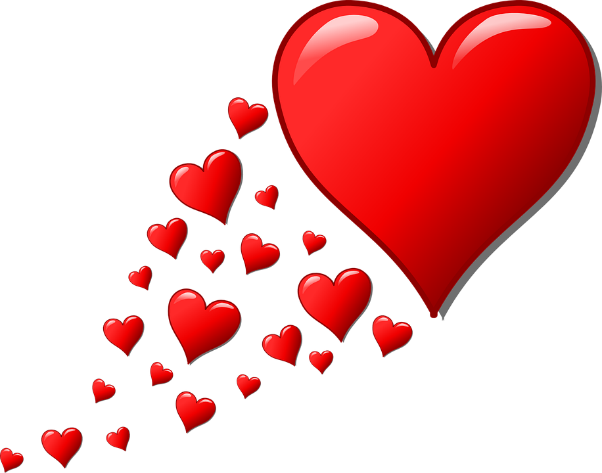 We are gearing up for all the love that will be showered as cupid gets ready to pull his arrow on or around February 14th. As always, we want you to be able to put our best smile forward. We recommend a visit to The DC Dentist in preparation for the big day. Give us a call at 202-544-3626 and we will be more than happy to help bring out your biggest, brightest smile. 1. Wake up and be thankful for another day, then grab your toothbrush and sing like it’s a microphone. 2. Practice flossing before brushing and afterwards rinsing after every meal. 3. Breathe in deeply the smell of toothpaste and mouth rinse. 4. Claim your boundaries between working hours and relaxing time and which events your toothbrush can accompany you. 5. Enjoy more bubble baths after brushing your teeth. 6. Eat good food always as it helps to sustain you which helps your teeth too. 7. Develop hobbies and enjoy learning new brushing habits techniques. 8. Sing to plants and take the time to notice the small things in life like your string of floss that does so much for you. 9. 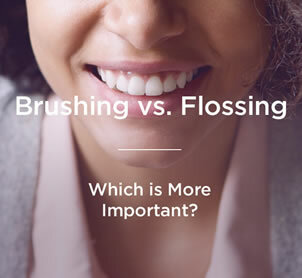 Sit and think about flossing, brushing and rinsing. 10. Explore new places to take your floss with you. 11. Hang out with your friends and family and invite them to The DC Dentist. 12. Read more books about holistic dentistry. 13. Keep a journal about your dental visits to The DC Dentist. 14. Catch the sunrise with your toothbrush beside you. 15. Spend less time on your phone and more time smiling thanks to The DC Dentist. 16. Buy yourself presents like a brand new pack of toothbrushes. 17. Try something new then try a new toothbrush. 18. Laugh out loud, The DC Dentist has you covered. 19. Have a glass of wine or pretend your rinse is wine but spit it out afterwards. 20. Enjoy being outdoors with your floss. 21. Daydream about flossing, brushing and rinsing. Then do it. 22. Make a bouquet with your toothbrushes. 23. Skinny-dip in the ocean or wear floss. 24. Listen to music and turn up the volume, then floss. 25. Drink lots of water, your teeth and tongue will thank you for it. Wondering if you’re using your toothbrush properly or even to its fullest potential? Our hygienists are happy to assist you in the proper brushing, flossing and rinsing techniques. It’s what we do! We love questions, it shows your concern for your overall health. Start your year off with a brand new soft bristle toothbrush and change your toothbrush every 3 months. And make your 6 month appointment to see your favorite holistic dentist, Dr. Victor. 1. Use it!- This one is obvious! Maintaining good oral health leads to overall health and wellness. 2. Sing using your toothbrush as a microphone- Grab your ipod and go to town! 4. Twirl it between your fingers as a baton- Who says a parade needs to be taking place? 7. Tame your eyebrows- Keep those unruly strands in check. 8. Hair Dye Applicator: Toothbrushes’ bristles are perfect for applying at home hair dye to make sure you’ve covered all of the important spots! 9. Keep Nails Clean- Let your fingers soak in a bowl of warm water and soap, then use your toothbrush to scrub under and around your nails. Lastly, apply a cuticle oil to moisturize. 10. Get A Clump-Free Flutter- To give your lashes natural-looking definition, dab some mascara onto your toothbrush to gently coat them, without making them clumpy. 11. Fix Tanning Faux Pas- Create a paste by mixing baking soda and lemon juice and apply it to splotchy areas. Use your toothbrush to scrub away all traces of excess tanner. 14. Keep a brush/floss daily tracker - Here’s a quick quiz on flossing you can use to test your dental knowledge. Click here to learn more. 17. Re-use old toothbrushes as an art brush: Toothbrushes can provide an amazing texture and style to your next art project! 20. Exfoliate your lips: Swipe a little moisturizer on your lips, then gently brush them with the bristles of a clean, soft toothbrush in small circular motions (not unlike brushing your teeth). This trick removes any dry flakes of dead skin for smooth, lipstick-ready smackers. 21. Clear up pimples Dab a bit of non-gel, nonwhitening toothpaste on the offending spot, and it should be dried up by morning. The toothpaste dehydrates the pimple and absorbs the oil. This remedy works best on pimples that have come to a head. Caution: This remedy may be irritating to sensitive skin. 22. Clean smells from hands the ingredients in toothpaste that deodorize your mouth will work on your hands as well. If you’ve gotten into something stinky, wash your hands with toothpaste, and they’ll smell great. Dentists everywhere often hear from their patients, “How do my teeth impact on my health, since they are just teeth. Right?” A good dentist then begins an explanation of how all aspects and systems of the body are connected—we are truly holistic organisms. Our mouth is such an integral part of our well-being. It is a major point of esthetics. Can you imagine someone you consider very attractive missing their two front teeth? That would decrease their attractiveness and for them it could also become a self-esteem issue. But our teeth and our mouth goes far beyond simply esthetics or attractiveness. Our mouth is the first stage of food digestion. If we do not break down food sufficiently so the gut can digest it, many problems can be created. Incomplete digestion has been seen as contributing to leaky gut syndrome. This is where the gut tissue has spaces between it so food is able to pass through it and enter the bloodstream directly, rather than traveling through the intestines. This can cause significant issues with bowel diseases. Incomplete digestion can also cause many other digestive disorders. Missing teeth is also something that can have major implications on our overall health. If we have missing teeth, we are not able to chew properly. This also does not allow the gut to receive, breakdown or digest food properly. Missing teeth also causes our existing teeth to shift and when this happens, it changes the way our teeth come together or our bite. If your bite is “off”, it can affect many aspects of our mouth. It can cause pain in our jaw joint, which can cause headaches as well as soreness in the muscles of our jaw. This can also effect the muscles in the neck and back. Even further, since all the muscles are connected, it could go as far as affecting the hip joint. The mouth is also a great indicator of the health of the overall body. In Chinese medicine, a skilled practitioner can get information on many systems of the body by looking at the tongue. The mouth is also where genetic material of the body is stored. From a cheek swab, information can be gathered on ancestry, genetic makeup as well as the health status of the body. The mouth is really connected to and is a doorway to the rest of the body. When seeing a holistic dentist, your overall health is taken into consideration when evaluating any findings from your bi-annual exams. It is recommended is to see your dentist and hygienist at least twice a year as preventive care is the best care. So, tonight’s homework is to make an appointment for yourself and your family with your dental office, and be proactive for the year ahead. Dr. Terry Victor, DDS, The DC Dentist, provides holistic, biological and eco-friendly general restorative and cosmetic dentistry. His practice is located at 509 11th Street SE on Capitol Hill. 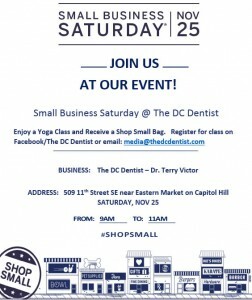 For more information, call 202-544-3626 or visit TheDCDentist.com. “If everyone does a little we can do a lot to save our earth,” says Dr. Terry Victor of The DC Dentist. A finalist for the Department of Energy and Environment Sustainability People’s Choice Awards for 2016, The DC Dentist promotes the connection between oral health and overall health in a green environment. This Sustainability Award recognizes and encourages green practices. The DC Dentist, member of Green America and Eco-Dentistry, organizations in support of green businesses, recently was visited by DC Sustainability Energy Utility and Green Impact Campaign, to receive more green advice. While in dental school, Victor envisioned a practice that decreases its carbon footprint while putting patients’ needs at the forefront, integrating their oral care with their overall health within a sustainable structure. The DC Dentist provides general, cosmetic and restorative dentistry while remaining the only Holistic, Biological and Eco-Friendly Dental Office in the DC Metropolitan Area. Stepping into the office you land on original flooring from the early 1900s, you notice ceiling tile made of recycled bottles keeping them out of the landfills then sit on refurbished furniture in front of windows treated for protection against UV rays. The office sports 30 eco-friendly aspects, including a green roof. “It’s important to me to find the safest measures to protect my staff and my patients as I wanted to ensure a safe environment from a medical point of view as well as from an environmental impact,” says Dr. Victor. Watch for more green to come in 2017! During this month we tend to spend more than we intend and we put off our own health to do things for others. For the next 21 days we will take time to improve our own self with the Prosperity in 21 Days. This also includes smile prosperity. Join us as we look inward and improve our prosperity and good health over the next 21 days. Read the first affirmation by Kaya Singer and the second from The DC Dentist. 1. I give gratitude for my perfect life and for everyone in it. I am grateful for my health and will work to remain in good health. 2. My power is helping me to change my prosperity imprint. I have a powerful toothbrush and will use it to fight plaque each and every day. 3. I clearly visualize my new prosperity imprint. I visualize myself flossing, brushing and rinsing after every meal. 4. I am taking right action to manifest my vision. The action I’m taking to improve my oral health will positively affect my overall health. 5. I have a positive attitude regardless of the situation. My positive attitude surrounding my oral care will make my Hygienist smile. 6. I give money to a worthy cause or person each and every day. I give a smile and the world smiles back at me. 7. I always receive and pay myself first. The toothbrush I receive after my 6 month appointment is appreciated and well used. 8. Everyday I give value to other people's lives. I value my time spent at The DC Dentist. 9. I have unconditional self-worth now. My self-worth is seen in my beautiful smile. 10. I forgive everyone and I unblock the flow of prosperity. I forgive myself when I forget to floss and remind myself to do it the next time. 11. The seeds of prosperity are growing within my being. The seeds of good oral health have been planted in my mind and my family’s too. 12. I have space in my life for prosperity. There is space for improvement, that’s why we see the Dentist. 13. I always present myself as a prosperous person. At the present moment I am brushing my teeth and will be done in a couple of minutes. 14. My mind is sharp, focused and clear. I am focused on correcting any bad oral habits. 15. I easily move into my expansive prosperity space. The field of Dentistry is expansive and I appreciate The DC Dentist as they are the only Holistic, Biological and Eco-Friendly Dental Office in the DMV area. 16. I have a strong, supportive prosperity team. The DC Dentist team is the finest staff I know. 17. I know my purpose and what the world needs from me. My purpose is to have Healthy Teeth & Gums for Life. 18. I give myself alone time to hear and listen. During alone time I’m constantly thinking of brushing my teeth. 19. I live a life of laughter, freedom and lightness. The laughter that fills the air when I tell my Dentist I have a crush on my toothbrush is priceless. 20. I am tenacious in my commitment to change my prosperity imprint. I am tenacious in my commitment to flossing, bushing and rinsing after each meal. 21. I welcome the birth of my new prosperity imprint. The birth of a new me means I will always take my oral care seriously. That’s why at The DC Dentist we look at each patient’s overall health and well-being. We work in conjunction with your Medical Doctor to provide you with the best care possible. Having regular checkups every 6 months or sooner not only helps to prevent problems but provides you with good oral hygiene. Everyone who steps through our doors receives a free oral cancer screening. With this being National Dental Hygiene Month as well as Breast Cancer Awareness Month, we want everyone to know the importance of receiving great preventive care. 2. Help avoid Gum Disease Brushing your teeth at least twice a day, flossing after each meal and using a mouth rinse will help to maintain your teeth. Dental cleanings every 6 months with proper oral maintenance will help prevent gum disease. Our Hygienists work with you to provide the best preventive care. If gum disease is diagnosed early we can help to treat and reduce the effects otherwise it could lead to loss of teeth. Let us help protect your gums! 3. Have good health Having clean teeth is a team effort. Poor hygiene habits can lead to a host of problems like gum disease, bone loss, infections, heart disease, etc. Treating Gum Disease is good for your overall health in that good oral health can help with diabetes, hypertension and heart disease. We want you to have good overall health that’s why we work with you to achieve good oral health. 4. Maintain your natural teeth Did you know that having your own teeth in your mouth can prolong your life for at least 10 years? A leading reason adult’s loose teeth is due to gum disease. Having teeth keeps your digestive track in order, allowing you to chew and digest your food properly. Our fuel is our food and must be chewed properly to aid in our digestion. To floss or not to floss appears to be an easy question, or is it? Who better to ask than your very own hygienist? While many peoples first instinct is to choose the toothbrush, our dental hygienist says you may be making the wrong decision. A recent report from the Associated Press, concluded that there isn’t a compelling reason to floss, stating that the recommendation lacks any evidence that flossing actually helps. Despite the recent articles, when this question was posed to our dental hygienist at The DC Dentist, she without hesitation chose dental floss. While acknowledging that in addition to seeing your dentist at least twice per year, both are equally important in maintaining optimal oral health, she meticulously explained that dental floss is the only way to rid our mouths of the dangerous culprit responsible for setting into motion the decline of our overall dental health- Biofilm. Biofilm is the plaque that forms on your teeth and causes tooth decay and periodontal disease. Biofilm is a slimy glue like substance that thrives in moist environments. The bacteria can attach to virtually any surface, including your teeth and oral tissues and dental floss is the only way to remove biofilm from between teeth where most cavities begin to form. Dental flossing should always be done in tandem with regular brushing and regular six month visits to the dentist and it is important that both are given equal priority in maintaining your overall oral health. Unmonitored biofilm can lead to gingivitis, which then leads to inflamed gums. Inflamed gums can then lead to periodontal disease which causes bone loss. Bone loss and resorption causes teeth to become loose and ultimately lost. Also, oral bacteria contributes to the narrowing of artery walls which can cause heart disease. None of this is worth the risk. Dr. Terry Victor, a holistic, biological and eco-friendly dentist based in Washington, DC: “As a dentist and despite this recent article citing the small number of studies, sample sizes, and some concerns regarding interpretation of the results, I will continue telling my patients in addition to visiting their dentist every six months, to floss daily. Dentists know immediately, by examining a patient’s mouth, whether they’re flossing or not. The impact of flossing in my patients is undeniable. Since this study has become public, I’ve spoken to many of my patients who’ve been eager to talk about it. Some have even began excusing and justifying their lack of diligence in this area by citing this recent study as liberation. They fail to realize that weak evidence for flossing doesn’t necessarily translate to mean that flossing is totally ineffective. If done properly, at the very minimum, flossing is a low–cost and low-risk procedure that helps to prevent tooth decay that can originate from the presence of acid-producing bacterial biofilm between teeth. Cavities easily form between teeth due to the lack of flossing. I’ve seen the difference in flossing in my own mouth and definitely in the mouths of my patients. If we can dislodge plaque build-up and prevent gum disease, we can help patients maintain healthy teeth and gums for life. These benefits then translate into the patient’s overall health. Dental floss remains an essential tool to use within my practice.” The DC Dentist’s mission is for everyone to maintain healthy teeth and gums for life. Through oral health education, regular dental check-ups, brushing, along with proper flossing techniques, we wish for everyone to achieve optimal overall health. Dr. Victor and staff recommend flossing, brushing, and rinsing after each meal whenever possible and visiting The DC Dentist at least twice per year. Once again the summer has managed to pass us by in the blink of an eye. It’s hard to believe that it’s almost time for kids to return back to school. That universally they are all about to make the big transition from lazy summer mornings to mad dashes to bus stops. While kids have focused on having fun and making the most of their time off this summer, many have eaten far too many sweets and have neglected to remain on top of their oral health. With the summer coming to a close, it’s important that kids be vibrant and healthy as they prepare to learn and be successful prior to returning to school. Now is the perfect time to ensure that your child gets their dental checkup and cleaning to ensure that valuable class days aren’t wasted on future dental appointments. Take advantage of the remaining summer freedom and schedule your back to school dental checkup today with The DC Dentist. The Staff of The DC Dentist wishes to thank all for voting us Best Dentist in the Washington City Paper. As the first Holistic, Biological & Eco-Friendly Dental Office on the East Coast it is quite an honor to be named Best of DC. We strive to provide each patient with the best possible care, paying careful attention to our patient’s overall health and well-being, making sure our environment is professional and friendly as well as lessening our carbon footprint on the earth. The combination of holistic, biological and eco-friendly is quite unique and this aids us in determining the best possible treatment for you. Dr. Terry Victor utilizes advances in medical technology through his ongoing Continuing Educational Classes which he attends several times a year. Dr. Victor offers treatments that are less invasive and those which will provide a healthier approach to your oral care. To schedule your appointment please call 202-544-3626. Thank you again for voting us, Best of DC! 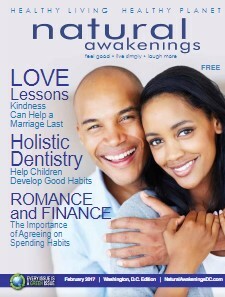 Learn more about Holistic Dentistry in this new article in Natural Awakenings on page 25, available online and in local stores throughout the DC Metropolitan Area. Click here to read the article. Brush your teeth after every meal or at least two times a day, floss and rinse nightly. If you stray from the routine, just pick it up again. We recommend you change your toothbrush at least every 2-3 months. Stepping into cold & flu season, you should change your toothbrush more often. Most importantly, once you are no longer sick, change your toothbrush to prevent spreading those same cold/flu germs you just cleaned out of your system. It's best to use a toothpaste that has no sugar or sugary type products and your mouth rinse should be non-alcoholic. Sugar is the very substance which we wish to clean away from your teeth and should not be in your toothpaste nor should you use Sodium Lauryl Sulfate as that is known to cause allergic reactions in the mouth. We also don't recommend mouth rinses that contain alcohol as alcohol reduces saliva, your mouth's natural lubricant. Non-alcoholic mouth rinses can be used by the entire family. Please read your labels well when selecting your toothpaste and mouth rinse.